Since I discovered this method, I would never do it any other way. 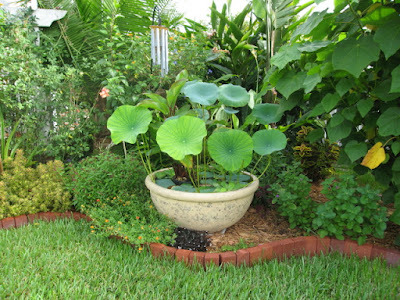 Especially here in Florida, a flowerbed created this way is ready to be planted in just a few short weeks. 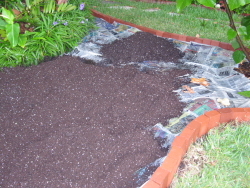 No need to dig up weeds or grass, especially the tough Augustine grass, it will be smothered and turned to fertilizer. Layering is the key, just like making a lasagna in the kitchen. 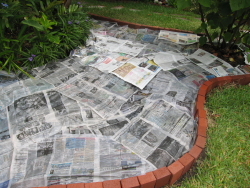 Layer materials can be: grass clippings, leaves, manure, compost, peat moss, but you must have newspaper. First step is laying the outline of the new flowerbed. 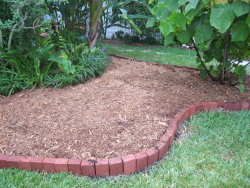 I find having a firm edging will keep the flowerbed in the shape I want it, and it does keep the soil contained. 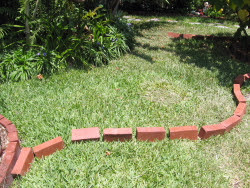 Creating this border with bricks is not that time-consuming as one thinks. DH takes the big shovel and cuts along the outline, front and back of the bricks, lifting the grass as he goes along. 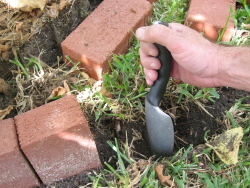 Having created a trench, he then uses the hand shovel to adjust the depth to what is needed for the bricks to be buried about 1/3 deep. Newspaper is most important and for me it is easier to work with than cardboard. It suffocates the grass underneath it. I put down 4 (at least 4!) layers of newspaper, while DH sprays the paper with water, to soak it AND to keep it in place. There is always a breeze going in FL, the paper just wouldn't stay in place without being moistened right away. Careful, so not to rip the newspaper, we spread some grass clippings, leaves, followed by the compost. the next layer will be cow manure and some leftover potting soil. With a soft spray, the new flowerbed gets watered well. 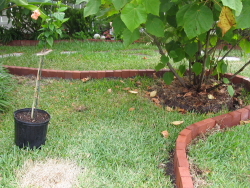 Watered daily and with the Florida heat, the flowerbed is ready to be planted in two weeks. Here now the finished flowerbed done lasagna style. The layers are up to the top of the brick edging and mounded even a bit higher to make up for the settling of it all.